The Spanish Empire (Spanish: Imperio español) was one of the largest empires in world history and one of the first of global extent. It reached the peak of its military, political and economic power under the Spanish Habsburgs through the 16th and 17th centuries, and its greatest territorial extent under the Bourbons in the 18th century when it was the largest empire in the world. The Spanish Empire became the foremost global power of its time, and was the first to be called the empire on which the sun never sets. The empire, administered from Madrid by the Spanish Crown, comprised territories and colonies in Europe, the Americas, Africa, Asia and Oceania. It originated during the Age of Exploration after the voyages of Christopher Columbus and lasted until the late 19th century. Spain's territorial reach beyond Europe included the Greater Antilles, half of South America, most of Central America and much of North America (including present day Mexico, Florida and the Southwestern and Pacific Coastal regions of the United States), as well as a number of Pacific Ocean archipelagos including the Philippines. The bulk of Spain's Empire was held for over three centuries, starting in 1492 with the Spanish colonization of the Americas and lasting until the early 19th century Spanish American wars of independence that left only Cuba, Puerto Rico, and the Philippines as Spanish. Following the Spanish–American War of 1898, Spain ceded its last colonies in the Caribbean and the Pacific to the United States. 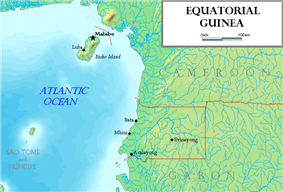 Its last African colonies were granted independence in 1975. In conjunction with the territories of the Portuguese Empire, which Spain controlled from 1580 to 1640, the Spanish Empire started the European dominance in global affairs. The Spanish Empire has left a huge cultural, urban and architectural legacy in the Western Hemisphere. Hundreds of towns and cities in the Americas were founded during the Spanish period. The tangible heritage includes forts, churches, schools, hospitals, government buildings and colonial residences, many of which still stand today. Many present-day roads, canals, ports or bridges sit where Spanish engineers built them centuries ago. 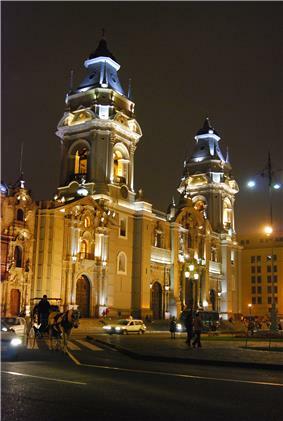 The oldest universities in the Americas were founded by Spanish scholars and Catholic missionaries. The Spanish Empire also left a vast cultural and linguistic legacy. With over 470 million native speakers today, Spanish is the second most spoken native language in the world, as result of the introduction of the language of Castile—Castilian, "Castellano" —from Iberia to Spanish America, later expanded by the governments of the independent republics. Other cultural legacies of the Spanish empire overseas was Roman Catholicism, which remains today the main religion in Spanish America. The cultural legacy is also present in the music, architecture, cuisine and fashion of much of Spanish America. The land of the Iberian peninsula was commonly called Hispania since Roman times and during the Visigothic Kingdom. The Reconquista resulted in the emergence of four Christian realms: Castile, Aragon, Navarre and Portugal. The dynastic union between the Crown of Castile (which included the kingdom of Navarre after 1515) and the Crown of Aragon, by the Catholic Monarchs (Spanish: Reyes Católicos) initiated a political authoritarian system in force until the beginning of the 18th century, which has become known as the Spanish monarchy. During this period, the Spanish sovereign acted as monarch in a unitary manner over all his territories through a polisynodial system of Councils, although his power as king or lord varied from one territory to another, since each territory retained its own particular administration and juridical configuration. The unity did not mean uniformity. Under this political configuration, irrespective of the denominations  given to the "dynastic union" existing from 1580 to 1640, the Portuguese realm kept its own administration and jurisdiction over its territory as did the other kingdoms and realms ruled by the Spanish Habsburgs. Nevertheless, some historians assert that Portugal was a kingdom which formed part of the Spanish Monarchy at that time; while others draw a clear distinction between the Portuguese and the Spanish Empires. The Spanish Empire included the dominions of the Spanish monarch in the Americas, Asia, Oceania and Africa, but some disputes exist as to which European territories are to be counted. For instance, normally the Habsburg Netherlands are included, as they were part of the possessions of the King of Spain, were governed by Spanish officials, and were defended by Spanish troops. However, authors like the British historian Henry Kamen contend that these territories were not fully integrated into a Spanish state and instead formed part of the wider Habsburg possessions. Some historians use "Habsburg" and "Spanish" almost interchangeably when referring to the dynastic inheritance of Charles V or Philip II. During the 15th century, Castile and Portugal became territorial and commercial rivals in the western Atlantic. Portugal obtained several Papal bulls which acknowledged Portuguese control over the discovered territories, but Castile also obtained from the Pope the safeguard of its rights to the Canary Islands with the bulls Romani Pontifex dated 6 November 1436 and Dominatur Dominus dated 30 April 1437. The Conquest of the Canary Islands, inhabited by Guanche people, began in 1402 during the reign of Henry III of Castile, by Norman noblemen Jean de Béthencourt under a feudal agreement with the crown. The conquest was completed with the campaigns of the armies of the Crown of Castille between 1478 and 1496, when the islands of Gran Canaria (1478–1483), La Palma (1492–1493) and Tenerife (1494–1496) were subjected. The Seville in 1475 – the ancestor of the future and famous Casa de Contratación). The Castilian fleets fought all over the Atlantic Ocean, occupying temporarily the Cape Verde islands (1476), conquering the city of Ceuta in Tingitana Peninsula, in 1476 (nevertheless it was retaken by the Portuguese), and even attacked the Azores islands, being defeated at Praia. But the turning point of the war came in 1478, when a Castilian fleet sent by Ferdinand to conquer Gran Canaria lost men and ships to the Portuguese who expelled it, and above all, a large Castilian armada—full of gold—was entirely captured in the decisive battle of Guinea. The Treaty of Alcáçovas (4 September 1479), while assuring the Castilian throne to the Catholic Monarchs, reflected the Castilian naval and colonial defeat: "War with Castile broke out waged savagely in the Gulf [of Guinea] until the Castilian fleet of thirty-five sail was defeated there in 1478. 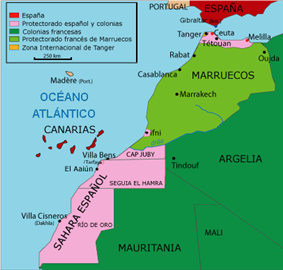 As a result of this naval victory, at the Treaty of Alcáçovas in 1479 Castile, while retaining her rights in the Canaries, recognized the Portuguese monopoly of fishing and navigation along the whole West Africa coast and Portugal's rights over the Madeira, Azores and Cape Verde islands [plus the right to conquer the Kingdom of Fez ]." The treaty delimited the spheres of influence of the two countries, establishing the principle of the Mare clausum. It was confirmed in 1481 by the Pope Sixtus IV, in the papal bull Æterni regis (dated on 21 June 1481). However, this experience would prove to be profitable for the future Spanish overseas expansion, because as the Spaniards were excluded from the lands discovered or to be discovered from the Canaries southward—and consequently from the road to India around Africa— they sponsored the Columbus' voyage towards West (1492) in search of Asia and its spices. Thus, the limitations imposed by Alcáçovas were overcome and a new and more balanced world's division would be reached at Tordesillas between both superpowers. 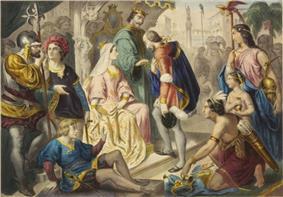 Columbus and the Catholic Monarchs (The return of Columbus to Spain). Anderson, James Maxwell (2000), The History of Portugal, Westport, Connecticut: Greenwood, . Archer, Christon; et al. (2002), World History of Warfare, Lincoln: University of Nebraska Press, . Brown, Jonathan; Elliott, John Huxtable (1980), A Palace for a King. The Buen Retiro and the Court of Philip IV, New Haven: Yale University Press, . Kamen, Henry (2003), Empire: How Spain Became a World Power, 1492–1763, New York: HarperCollins, . Lach, Donald F.; Van Kley, Edwin J. (1994), Asia in the Making of Europe, Chicago: University of Chicago Press, . Lockhart, James; Schwartz, Stuart B. (1983), Early Latin America: A History of Colonial Spanish America and Brazil, Cambridge: Cambridge University Press, . ^ Tracy, James D. (1993). The Rise of Merchant Empires: Long-Distance Trade in the Early Modern World, 1350–1750. Cambridge University Press. p. 35. ^ Farazmand, Ali (1994). Handbook of bureaucracy. M. Dekker. pp. 12–13. ^ Ruiz Martín, Felipe (1996). La proyección europea de la monarquía hispánica (in Spanish). Editorial Complutense. p. 473. ^ Ruiz Martín, Felipe (1996). La proyección europea de la monarquía hispánica (in Spanish). Editorial Complutense. p. 465. ^ ... 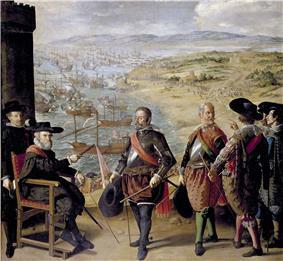 In August, the Duke besieged Ceuta [The city was simultaneously besieged by the moors and a Castilian army led by the Duke of Medina Sidónia] and took the whole city except the citadel, but with the arrival of Afonso V in the same fleet which led him to France, he preferred to leave the square. As a consequence, this was the end of the attempted settlement of Gibraltar by converts from Judaism ... which D. Enrique de Guzmán had allowed in 1474, since he blamed them for the disaster. See Ladero Quesada, Miguel Ángel (2000), "Portugueses en la frontera de Granada" in En la España Medieval ,vol. 23 (in Spanish), p. 98, ISSN: 0214-3038. ^ The Canary's campaign: Alfonso de Palencia, Decada IV, Book XXXI, Chapters VIII and IX ("preparation of 2 fleets" [to Guinea and to Canary, respectively] "so that with them King Ferdinand crush its enemies" [the Portuguese] ...). Palencia wrote that the conquest of Gran Canary was a secondary goal to facilitate the expeditions to Guinea (the real goal), a means to an end. ^ Alfonso de Palencia, Decada IV, book XXXII, chapter III: on 1478 a Portuguese fleet intercepted the armada of 25 navies sent by Ferdinand to conquer Gran Canary – capturing 5 of its navies plus 200 Castilians – and forced it to fled hastily and definitively from the Canary waters. This victory allowed Prince John to use the Canary Islands as an "exchange coin" in the peace treaty of Alcáçovas. ^ Pulgar, Hernando del (1780), Crónica de los señores reyes católicos Don Fernando y Doña Isabel de Castilla y de Aragon (in Spanish), chapters LXXVI and LXXXVIII ("How the Portuguese fleet defeated the Castilian fleet which had come to the Mine of Gold"). From the Biblioteca Virtual Miguel de Cervantes. ^ Waters, David (1988), Reflections Upon Some Navigational and Hydrographic Problems Of The XVth Century Related To The Voyage Of Bartolomeu Dias, 1487–88, p. 299, in the Separata from the Revista da Universidade de Coimbra, vol. XXXIV. ^ Burbank, Jane; Frederick Cooper (2010). Empires in World History: Power and the Politics of Difference. Princeton University Press. pp. 120–121. ^ Fernández Herrero, Beatriz (1992). La utopía de América: teoría, leyes, experimentos (in Spanish). Anthropos Editorial. p. 143. ^ McAlister, Lyle N. (1984). Spain and Portugal in the New World, 1492–1700. U of Minnesota Press. p. 69. ^ Historia general de España y América (in Spanish) 10. Ediciones Rialp. 1992. p. 189. ^ Fernández Herrero, Beatriz (1992). La utopía de América: teoría, leyes, experimentos (in Spanish). Anthropos Editorial. p. 141. ^ Diffie, Bailey Wallys; Winius, George Davison (1977). Foundations of the Portuguese Empire, 1415–1580. University of Minnesota Press. p. 173. ^ Bethell, Leslie (1984). The Cambridge History of Latin America 1. Cambridge University Press. p. 289. ^ Sánchez Bella, Ismael (1993). Instituto de investigaciones jurídicas UNAM, ed. "Las bulas de 1493 en el Derecho Indiano" (PDF). Anuario Mexicano de Historia del Derecho (in Spanish) 5: 371. ^ a b Sánchez Prieto, Ana Belén (2004). La intitulación diplomática de los Reyes Católicos: un programa político y una lección de historia (PDF) (in Spanish). III Jornadas Científicas sobre Documentación en época de los Reyes Católicos. p. 296. ^ a b Hernández Sánchez-Barba, Mario (1990). La Monarquía Española y América: Un Destino Histórico Común (in Spanish). Ediciones Rialp. p. 36. ^ Roca Tocco, Carlos Alberto (1993). "De las bulas alejandrinas al nuevo orden político americano" (PDF). Anuario Mexicano de Historia del Derecho (in Spanish) (Instituto de investigaciones jurídicas UNAM) 5: 331. ^ Salinas Araneda, Carlos (1983). "El proceso de incorporacion de las indias a castilla". Revista de Derecho de la Pontificia Universidad Católica de Valparaíso (in Spanish) (Ediciones Universitarias de Valparaíso) 7: 23–26. ^ Elliott, John Huxtable (2007). Empires of the Atlantic World: Britain and Spain in America 1492–1830. Yale University Press. p. 120. ^ Anuario de estudios americanos – Volumen 32. ^ In this context, "capitulations" mean separate items capitulos of the contract, defining rights and obligations. ^ Diego-Fernández Sotelo, Rafael (1987). Las capitulaciones colombinas (in Spanish). El Colegio de Michoacán A.C. p. 139. ^ Diego-Fernández Sotelo, Rafael (1987). Las capitulaciones colombinas (in Spanish). El Colegio de Michoacán A.C. pp. 143–145. ^ Diego-Fernández Sotelo, Rafael (1987). Las capitulaciones colombinas (in Spanish). El Colegio de Michoacán A.C. pp. 147–149. ^ Sibaja Chacón, Luis Fernando (2006). El cuarto viaje de Cristóbal Colón y los orígenes de la provincia de Costa Rica (in Spanish). EUNED. p. 117. ^ Lynch, John (2007). Los Austrias (1516–1700) (in Spanish). Editorial Critica. p. 203. ^ Díaz del Castillo, Bernal (2005). José Antonio Barbón Rodríguez, ed. Historia verdadera de la conquista de la Nueva España: Manuscrito "Guatemala" (in Spanish). UNAM. p. 656. ^ Edwards, John; Lynch, John (2005). Edad Moderna: Auge del Imperio, 1474–1598 (in Spanish) 4. Editorial Critica. p. 290. ^ Historia general de España y América (in Spanish) 7. Ediciones Rialp. 1992. p. 232. ^ Gómez Gómez, Margarita (2008). El sello y registro de Indias: imagen y representación (in Spanish). Böhlau Verlag Köln Weimar. p. 84. ^ Mena garcía, Carmen (2003). "La Casa de la Contratación de Sevilla y el abasto de las flotas de Indias". In Antonio Acosta Rodríguez, Adolfo Luis González Rodríguez, Enriqueta Vila Vilar. La Casa de la Contratación y la navegación entre España y las Indias (in Spanish). Universidad de Sevilla. p. 242. ^ Gómez Gómez, Margarita (2008). El sello y registro de Indias: imagen y representación (in Spanish). Böhlau Verlag Köln Weimar. p. 90. ^ Brewer Carías, Allan-Randolph (1997). La ciudad ordenada (in Spanish). Instituto Pascual Madoz, Universidad Carlos III. p. 69. ^ Martínez Peñas, Leandro (2007). El confesor del rey en el Antiguo Régimen (in Spanish). Editorial Complutense. p. 213. ^ Arranz Márquez, Luis (1982). Don Diego Colón, almirante, virrey y gobernador de las Indias (in Spanish). CSIC. pp. 89–90. ^ Arranz Márquez, Luis (1982). Don Diego Colón, almirante, virrey y gobernador de las Indias (in Spanish). CSIC. p. 97. ^ Rialp, Ediciones, S.A. (1992). Historia general de España y América (in Spanish) 10. Ediciones Rialp. p. 195. ^ Arranz Márquez, Luis (1982). Don Diego Colón, almirante, virrey y gobernador de las Indias (in Spanish). CSIC. p. 101. ^ Kozlowski, Darrell J. (2010). Colonialism. Infobase Publishing. p. 84. ^ Sibaja Chacón, Luis Fernando (2006). El cuarto viaje de Cristóbal Colón y los orígenes de la provincia de Costa Rica (in Spanish). EUNED. p. 39. ^ Rialp, Ediciones, S.A. (1992). Historia general de España y América (in Spanish) 10. Ediciones Rialp. p. 174. ^ Rialp, Ediciones, S.A. (1992). Historia general de España y América (in Spanish) 10. Ediciones Rialp. p. 186. ^ Sibaja Chacón, Luis Fernando (2006). El cuarto viaje de Cristóbal Colón y los orígenes de la provincia de Costa Rica (in Spanish). EUNED. p. 36. ^ Rialp, Ediciones, S.A. (1992). Historia general de España y América (in Spanish) 10. Ediciones Rialp. p. 197. ^ Carrera Damas, Germán (1999). Historia general de América Latina (in Spanish). UNESCO. p. 457. ^ Mena García, María del Carmen (1992). Pedrarias Dávila (in Spanish). Universidad de Sevilla. p. 29. ^ Sibaja Chacón, Luis Fernando (2006). El cuarto viaje de Cristóbal Colón y los orígenes de la provincia de Costa Rica (in Spanish). EUNED. p. 50. ^ Sibaja Chacón, Luis Fernando (2006). El cuarto viaje de Cristóbal Colón y los orígenes de la provincia de Costa Rica (in Spanish). EUNED. pp. 55–59. ^ Sibaja Chacón, Luis Fernando (2006). El cuarto viaje de Cristóbal Colón y los orígenes de la provincia de Costa Rica (in Spanish). EUNED. p. 32. ^ Rialp, Ediciones, S.A. (1992). Historia general de España y América (in Spanish) 10. Ediciones Rialp. p. 165. ^ Sibaja Chacón, Luis Fernando (2006). El cuarto viaje de Cristóbal Colón y los orígenes de la provincia de Costa Rica (in Spanish). EUNED. pp. 36–37. ^ Colón de Carvajal, Anunciada; Chocano Higueras, Guadalupe (1992). Cristóbal Colón: incógnitas de su muerte 1506–1902 (in Spanish). CSIC. p. 40. ^ Carrera Damas, Germán (1999). Historia general de América Latina (in Spanish). UNESCO. p. 458. ^ Quoted in Fernand Braudel, The Wheels of Commerce, vol. II of Civilization and Capitalism 15th–18th Century 1979:171. ^ The Tempest and Its Travels – Peter Hulme – Google Libros. Books.google.es. Retrieved on 2013-07-29. ^ Delamarre-Sallard, Catherine (2008). Manuel de civilisation espagnole et latino-américaine (in Spanish). Editions Bréal. p. 130. ^ Sanz Ayán, Carmen (1993). Sevilla y el comercio de Indias (in Spanish). Ediciones AKAL. p. 23. ^ Cano, José (2007). "El gobierno y la imagen de la Monarquía Hispánica en los viajeros de los siglos XVI y XVII. De Austrias a Borbones". La monarquía de España y sus visitantes: siglos XVI al XIX Colaborador Consuelo Maqueda Abreu (in Spanish). Editorial Dykinson. pp. 21–22. ^ Jiménez Núñez, Alfredo (2006). El gran norte de México: una frontera imperial en la Nueva España (1540–1820) (in Spanish). Editorial Tebar. p. 41. ^ Andreo García, Juan (2007). "Su Majestad quiere gobernar: la Administración española en Indias durante los siglos XVI y XVII". 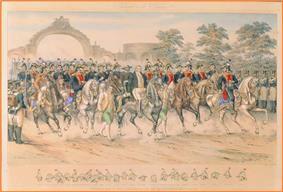 In Juan Bautista Vilar, Antonio Peñafiel Ramón, Antonio Irigoyen López. Historia y sociabilidad: homenaje a la profesora María del Carmen Melendreras Gimeno (in Spanish). EDITUM. p. 279. ^ Góngora, Mario (1998). Estudios sobre la historia colonial de hispanoamérica (in Spanish). p. 99. ^ Lagos Carmona, Guillermo (1985). Los títulos históricos (in Spanish). Editorial Andrés Bello. p. 119. ^ Lagos Carmona, Guillermo (1985). Los títulos históricos (in Spanish). Editorial Andrés Bello. p. 122. ^ Historia general de España y América (in Spanish) 7. Ediciones Rialp. 1992. p. 601. ^ Góngora, Mario (1998). Estudios sobre la historia colonial de hispanoamérica (in Spanish). Editorial Universitaria. p. 97. ^ Muro Romero, Fernando (1975). Las presidencias-gobernaciones en Indias (siglo XVI) (in Spanish). CSIC. p. 177. ^ Malberti de López, Susana (2006). "Las instituciones políticas en la región de Cuyo". In Instituto de Historia Regional y Argentina "Héctor Domingo Arias". Desde San Juan hacia la historia de la región (in Spanish). effha. p. 141. ^ a b Bushnell, Amy (1981). The King's Coffer: Proprietors of the Spanish Florida Treasury 1565–1702. Gainesville, Florida: University Presses of Florida. pp. 1–2. ^ a b Chipman, Donald E. (2005). Moctezuma's Children: Aztec Royalty under Spanish Rule, 1520–1700 (Individual e-book (no page numbers) ed.). Austin, Texas: University of Texas Press. ^ Parry, John Horace (1966). The Spanish Seaborne Empire (First paperback 1990 ed.). Berkeley, California: University of California Press. pp. 202–203. ^ Historia general de España y América (in Spanish) 10. Ediciones Rialp. 1992. p. 473. ^ Delgado de Cantú, Gloria M. (2002). Historia de México, (in Spanish) 1. Pearson Educación. p. 266. ^ Silva Galdames, Osvaldo (2005). Atlas de Historia de Chile (in Spanish). Editorial Universitaria. p. 50. ^ Vicente Villarán, Manuel (1998). Lecciones de derecho constitucional (in Spanish). Fondo Editorial PUCP. p. 472. ^ a b Góngora, Mario (1998). Estudios sobre la historia colonial de hispanoamérica (in Spanish). p. 100. ^ a b c Garavaglia, Juan Carlos; Marchena Fernández, Juan (2005). América Latina de los orígenes a la Independencia (in Spanish). Editorial Critica. p. 266. ^ a b Bosco Amores, Juan (2006). Historia de América (in Spanish). Editorial Ariel. p. 276. ^ a b Muro Orejón, Antonio, ed. (1977). Cedulario americano del siglo XVIII: Cédulas de Luis I (1724), Cédulas de Felipe V (1724–46) (in Spanish) 3. CSIC. p. 32. ^ a b Celso, Ramón Lorenzo (1994). Manual de historia constitucional Argentina (in Spanish) 1. Editorial Juris. p. 28. ^ a b c Bridikhina, Eugenia (2007). Theatrum mundi: entramados del poder en Charcas colonial (in Spanish). Plural Editores. p. 38. ^ Lohmann Villena, Guillermo (1999). "La nueva estructura política". In Carrera Damas, Germán. Historia general de América Latina (in Spanish) 2. UNESCO. p. 464. ^ Martínez Ruiz, Enrique (2007). Diccionario de historia moderna de España, (in Spanish) 2. Ediciones AKAL. p. 188. ^ Historia general de España y América (in Spanish) 10. Ediciones Rialp. 1992. p. 611. ^ Muro Romero, Fernando (1975). Las presidencias-gobernaciones en Indias (siglo XVI) (in Spanish). CSIC. p. 103. ^ Fernández Álvarez, Manuel (1979). España y los españoles en los tiempos modernos (in Spanish). Universidad de Salamanca. p. 513. ^ Bridikhina, Eugenia (2007). Theatrum mundi: entramados del poder en Charcas colonial (in Spanish). Plural Editores. p. 41. ^ Pinet Plasencia, Adela (1998). La Península de Yucatán en el Archivo General de la Nación (in Spanish). UNAM. p. 34. ^ Góngora, Mario (1998). Estudios sobre la historia colonial de hispanoamérica (in Spanish). p. 103. ^ Vicente Villarán, Manuel (1998). Lecciones de derecho constitucional (in Spanish). Fondo Editorial PUCP. p. 473. ^ Andreo García, Juan (2007). "Su Majestad quiere gobernar: la Administración española en Indias durante los siglos XVI y XVII". In Juan Bautista Vilar, Antonio Peñafiel Ramón, Antonio Irigoyen López. Historia y sociabilidad: homenaje a la profesora María del Carmen Melendreras Gimeno (in Spanish). EDITUM. p. 282. ^ Diego-Fernández, Rafael (2007). "Estudio introductorio". In Juan Bautista Vilar, Antonio Peñafiel Ramón, Antonio Irigoyen López. Historia y sociabilidad: homenaje a la profesora María del Carmen Melendreras Gimeno (in Spanish). EDITUM. p. xxix. ^ de Blas, Patricio (2000). Historia común de Iberoamérica (in Spanish). EDAF. p. 208. ^ Szászdi, Adam (2002). "Virreyes y Audiencias de Indias en el reinado de don Felipe II: Algunos señalamientos necesarios". In Feliciano Barrios. Derecho y administracion pub'lica en las Indias hispánicas: Actas del XII Congreso Internacional de Historia del Derecho Indiano, Toledo (in Spanish) 2. Universidad de Castilla La Mancha. p. 1709. ^ Rubio Mañé, Ignacio José (1992). El Virreinato (in Spanish) 1. UNAM. p. 45. ^ Rubio Mañé, Ignacio José (1992). El Virreinato (in Spanish) 1. UNAM. p. 50. ^ Morón, Guillermo (1995). Medina, José Ramón, ed. Obra escogida (in Spanish). Fundacion Biblioteca Ayacucho. p. 65. ^ Pinet Plasencia, Adela (1998). La Península de Yucatán en el Archivo General de la Nación (in Spanish). UNAM. p. 33. ^ Garavaglia, Juan Carlos; Marchena Fernández, Juan (2005). América Latina de los orígenes a la Independencia (in Spanish). Editorial Critica. p. 267. ^ Méndez Salcedo, Ildefonso (2002). 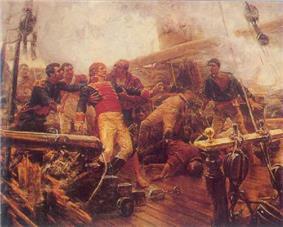 La Capitanía General de Venezuela, 1777–1821 (in Spanish). Universidad Católica Andrés Bello, Universidad de los Andes. p. 69. ^ Cornejo Franco, José (1993). Testimonios de Guadalajara (in Spanish). UNAM. p. viii. ^ de Blas, Patricio (2000). Historia común de Iberoamérica (in Spanish). EDAF. p. 210. ^ Bennassar, Bartolomé (2001). La América española y la América portuguesa: siglos XVI-XVIII (in Spanish). Akal. p. 98. ^ Delgado de Cantú, Gloria M. (2005). El mundo moderno y contemporáneo (in Spanish) 1. Pearson Educación. p. 90. ^ Orduña Rebollo, Enrique (2003). Municipios y provincias: Historia de la Organización Territorial Española (in Spanish). INAP. p. 238. ^ De Blas, Patricio (2000). 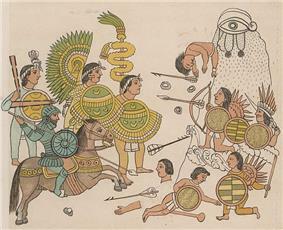 Historia Común de Iberoamérica (in Spanish). EDAF. p. 202. ^ Bennassar, Bartolomé (2001). La América española y la América portuguesa: siglos XVI-XVIII (in Spanish). Akal. p. 99. ^ Orduña Rebollo, Enrique (2003). Municipios y provincias: Historia de la Organización Territorial Española (in Spanish). INAP. p. 237. ^ Historia general de España y América (in Spanish) 10. Ediciones Rialp. 1992. p. 615. ^ Pérez Guartambel, Carlos (2006). Justicia indígena (in Spanish). Universidad de Cuenca. pp. 49–50. ^ Bosco Amores, Juan (2006). Historia de América (in Spanish). Editorial Ariel. p. 273. ^ Bennassar, Bartolomé (2001). La América española y la América portuguesa: siglos XVI-XVIII (in Spanish). Akal. p. 101. ^ Albareda Salvadó, Joaquim (2010). La Guerra de Sucesión de España (1700–1714). Editorial Critica. pp. 239–241. ^ "In one short year the unfortunate Spaniards saw their armies beaten in Portugal, Cuba and Manilla torn from their grasp, their commerce destroyed, and their fleets annihilated." In Prowse, D. W. – A History of Newfoundland: from the English, Colonial and Foreign Records, Heritage Books Inc., 2007, p. 311. ^ An early bandeira in 1628, (led by Antônio Raposo Tavares), composed of 2,000 allied Indians, 900 Mamluks (Mestizos) and 69 white Paulistanos, to find precious metals and stones and/or to capture Indians for slavery. This expedition alone was responsible for the destruction of most of the Jesuit missions of Spanish Guairá and the enslavement of 60,000 indigenous people. In response the missions that followed were heavily fortified. ^ Peña, Lorenzo (2002). Un puente jurídico entre Iberoamérica y Europa: la Constitución española de 1812 (PDF) (in Spanish). Casa de América-CSIC. pp. 6–7. The Spanish language (now the second most widely spoken language in the world) and the Roman Catholic faith were brought to America, parts of Africa and the Spanish East Indies, by Spanish colonization which began in the 15th century. It also played a crucial part in sustaining the Catholic Church as the leading Christian denomination in Europe when it was under extreme pressure. In time, there were in effect a self-funding force of occupation. By the 18th century, much of the Spanish territory was under de facto control of Portuguese-Brazil. This reality was recognised with the legal transfer of sovereignty in 1750 of most of the Amazon basin and surrounding areas to Portugal in the Treaty of Madrid. This settlement sowed the seeds of the Guarani War in 1756. 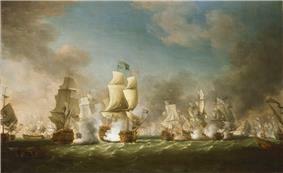 The Bourbon institutional reforms were to bear fruit militarily when Spanish forces easily retook Naples and Sicily from the Austrians in 1734 during War of the Polish Succession, and during the War of Jenkins' Ear (1739–1742) thwarted British efforts to seize the strategic cities of Cartagena de Indias and Santiago de Cuba by defeating a massive British army and navy led by Edward Vernon, which ended Britain's ambitions in the Spanish Main. 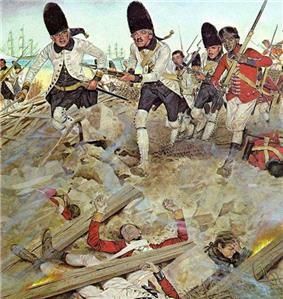 Moreover, though Spain was severely defeated during the invasion of Portugal and lost some territories to British forces towards the end of the Seven Years' War (1756–1763), she was to recover these losses and seize the British naval base in the Bahamas during the American Revolutionary War (1775–83). The ending of Cádiz's trade monopoly with America brought about a rebirth of Spanish manufactures. Most notable was the rapidly growing textile industry of Catalonia which by the mid-1780s saw the first signs of industrialisation. This saw the emergence of a small, politically active commercial class in Barcelona. This isolated pocket of advanced economic development stood in stark contrast to the relative backwardness of most of the country. Most of the improvements were in and around some major coastal cities and the major islands such as Cuba, with its plantations, and a renewed growth of precious metals mining in America. With a Bourbon monarchy came a repertory of Bourbon mercantilist ideas based on a centralized state, put into effect in America slowly at first but with increasing momentum during the century. Rapid shipping growth from the mid-1740s until the Seven Years' War (1756–1763), reflecting in part the success of the Bourbons in bringing illicit trade under control. With the loosening of trade controls after the Seven Years' War, shipping trade within the empire once again began to expand, reaching an extraordinary rate of growth in the 1780s. San Felipe de Barajas Fortress Cartagena de Indias. In 1741 the Spanish defeated a vast British invasion fleet and army from this fortress in present-day Colombia during the Battle of Cartagena de Indias. Immediately, Philip's government set up a ministry of the Navy and the Indies (1714) and created first a Honduras Company (1714), a Caracas company, the Guipuzcoana Company (1728) and—the most successful one—a Havana Company (1740). In 1717–1718, the structures for governing the Indies, the Consejo de Indias and the Casa de Contratación that governed investments in the cumbersome escorted fleets were transferred from Seville to Cádiz, which became the one port for all Indies trading (see flota system). Individual sailings at regular intervals were slow to displace the old habit of armed convoys, but by the 1760s there were regular packet ships plying the Atlantic between Cádiz and Havana and Puerto Rico, and at longer intervals to the Río de la Plata, where an additional viceroyalty was created in 1776. The contraband trade that was the lifeblood of the Habsburg empire declined in proportion to registered shipping (a shipping registry having been established in 1735). The 'so-called Spanish Bourbons' broadest intentions were to break the power of the entrenched aristocracy of the Criollos in America (locally born colonials of European descent), and, eventually, loosen the territorial control of the Society of Jesus over the virtually independent theocracies of Guarani Misiones: the Jesuits were expelled from Spanish America in 1767. In addition to the established consulados of Mexico City and Lima, firmly in the control of local landowners, a new rival consulado was set up at Vera Cruz. At the beginning of his reign, due to French influence and the War of the Spanish Succession, king Philip V, initiated organizational reforms headed for a government more executive, giving priority to the direct decision of the monarch, opposite to the deliberative way of the polisynodial system of Councils. Following the war, the new Bourbon monarchy would take a much more cautious approach to international relations, built upon a family alliance with Bourbon France, and continuing to follow a program of institutional renewal. Spain's economic and demographic recovery had begun slowly in the last decades of the Habsburg reign, as was evident from the growth of its trading convoys and much more rapid growth of illicit trade during the period, though this growth was slower than in its northern rivals who had gained increasing illicit access to its empire's markets. Critically, this recovery was not translated into institutional improvement because of the incompetent leadership of the unfortunate last Habsburg. This legacy of neglect was reflected in the early years of Bourbon rule in which the military was ill-advisedly pitched into battle against the Quadruple Alliance (1718–1720). Under the Treaties of Utrecht (11 April 1713), the European powers decided what the fate of Spain would be, in terms of the continental balance of power. The French prince Philippe of Anjou, grandchild of Louis XIV of France, became the new Bourbon king Philip V. He retained the Spanish overseas empire, but ceded the Spanish Netherlands, Naples, Milan, and Sardinia to Austria; Sicily and parts of Milan to the Duchy of Savoy; and Gibraltar and Minorca to the Kingdom of Great Britain. Moreover, Philip V granted the British the exclusive right to slave trading in Spanish America for thirty years, the so-called asiento, as well as licensed voyages to ports in Spanish colonial dominions, openings, as Fernand Braudel remarked, for both licit and illicit smuggling (Brudel 1984 p 418). Since the end of the reign of Philip II, the municipal offices, including the aldermen, were auctioned to alleviate the need for money of the Crown, even the offices could also be sold, which became hereditary, so that the government of the cities went on to hands of urban oligarchies. In order to control the municipal life, the Crown ordered the appointment of corregidores and alcaldes mayores to exert greater political control and judicial functions in minor districts. Their functions were governing the respective municipalities, administering of justice and being appellate judges in the alcaldes menores‍ '​ judgments, but only the corregidor could preside over the cabildo. 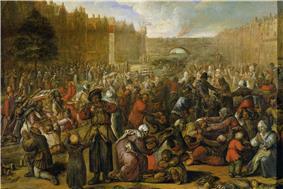 However, both charges were also put up for sale freely since the late 16th century. Spain passed some laws for the protection of the indigenous peoples of its New World colonies, the first such in 1542; the legal thought behind them was the basis of modern international law. Taking advantage of their extreme remoteness, the European colonists revolted when they saw their power being reduced, forcing a partial revoking of these New Laws. Later, weaker laws were introduced to protect the indigenous peoples but records show their effect was limited. The restored Encomenderos increasingly used native Indian workforce. The system of government in Spain was constituted by a polisynodial system of Councils which advised the monarch and made decisions on his behalf about specific matters of government. In 1524 it was established the Council of the Indies, based in Castile, with the assignment of the governance of the Indies, thus it was responsible for drafting legislation, proposing the appointments to the King and pronouncing judicial sentences; as maximum authority in the ultramarine territories, the Council of The Indies took over both the institutions in the Indies as the defense of the interests of the Crown and of the aborigens. Florida was colonized in 1565 by Pedro Menéndez de Avilés when he founded Saint Augustine and then promptly defeated an attempt led by the French Captain Jean Ribault and 150 of his countrymen to establish a French foothold in Spanish Florida territory. Saint Augustine quickly became a strategic defensive base for the Spanish ships full of gold and silver being sent to Spain from its New World dominions. 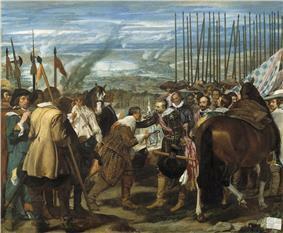 The Battle of Rocroi (1643), the symbolic end of Spain's grandeur. 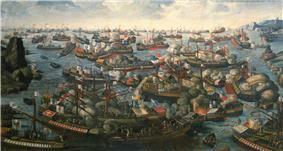 The Spanish Armada leaving the Bay of Ferrol (1588). 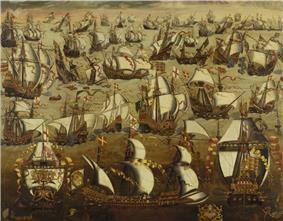 In 1588, hoping to put a stop to Elizabeth's intervention, Philip sent the Spanish Armada to attack England. Unfavourable weather, plus heavily armed and manœuvrable English ships, and the fact that the English had been warned by their spies in the Netherlands and were ready for the attack resulted in defeat for the Armada. However, the failure of the Drake–Norris Expedition to Portugal and the Azores in 1589 marked a turning point in the on-off 1585–1604 Anglo–Spanish War. The Spanish fleets became more effective in transporting greatly increased quantities of silver and gold from the Americas, while English attacks suffered costly failures. The defense of Cádiz, by Zurbarán. A map of the dominion of the Habsburgs following the abdication of Charles V (1556) as depicted in The Cambridge Modern History Atlas (1912); Habsburg lands are shaded green. From 1556 the lands in a line from the Netherlands, through to the east of France, to the south of Italy and the islands were retained by the Spanish Habsburgs. In 1543, the king of France Francis I announced his unprecedented alliance with the Islamic sultan of the Ottoman, Suleiman the Magnificent, by occupying the Spanish-controlled city of Nice in concert with Ottoman forces. Henry VIII of England, who bore a greater grudge against France than he held against the Emperor for standing in the way of his divorce, joined Charles V in his invasion of France. Although the Spanish were defeated at the Battle of Ceresole in Savoy the French army was unable to seriously threaten Spanish controlled Milan, whilst suffering defeat in the north at the hands of Henry, thereby being forced to accept unfavourable terms. 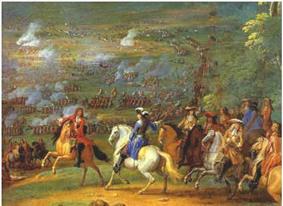 The Austrians, led by Charles's younger brother Ferdinand, continued to fight the Ottomans in the east. Charles went to take care of an older problem: the Schmalkaldic League. In 1533, Clement's refusal to annul the first marriage of King Henry VIII of England to Catherine of Aragon may have been partly or entirely motivated by his unwillingness to offend the emperor and have his capital sacked for perhaps a second time. 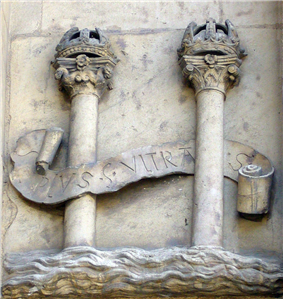 The Peace of Barcelona, signed between Charles V and the Pope in 1529, established a more cordial relationship between the two leaders. Spain was effectively named the protector of the Catholic cause and Charles was crowned as King of Italy (Lombardy) in return for Spanish intervention in overthrowing the rebellious Florentine Republic. King Charles I (Charles V (Holy Roman Emperor)) achieved victory at the Battle of Pavia in 1525 and surprised many Italians and Germans and elicited concerns that Charles would endeavor to gain ever greater power. Pope Clement VII switched sides and now joined forces with France and prominent Italian states against the Habsburg Emperor, resulting in the War of the League of Cognac. Charles grew exhausted with the pope's meddling in what he viewed as purely secular affairs. In 1527, Charles' army of mercenaries in northern Italy, underpaid and desiring to plunder the city of Rome, mutinied, advanced southward toward Rome, and sacked the city. The sack of Rome, while unintended by Charles, embarrassed the papacy sufficiently enough that Clement, and succeeding popes, were considerably more circumspect in their dealings with secular authorities. With the ascent of the king Charles I in 1516 and his election as sovereign of the Holy Roman Empire in 1519, Francis I of France found himself surrounded by Habsburg territories, invaded the Spanish possessions in Italy in 1521, and inaugurated the second war of Franco-Spanish conflict. 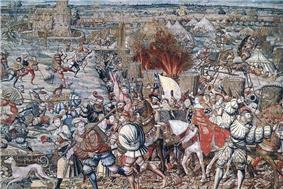 The war was a disaster for France, which suffered defeat at the Battle of Biccoca (1522), the Battle of Pavia (1525, at which Francis was captured), and the Battle of Landriano (1529) before Francis relented and abandoned Milan to Spain. Undermining the power of France and containing it in its eastern borders. Maintaining Catholic Habsburg hegemony in Germany, defending Catholicism against the Protestant Reformation. Charles attempted to quell the Reformation at the Diet of Worms but Martin Luther refused to recant his 'heresy.' However, Charles's piety could not stop his mutinying troops from plundering the Holy See in the Sacco di Roma. Defending Europe against Islam, notably the Ottoman Empire. To spread religion to the unconverted souls of the new world. With conflict between Catholics and Protestants raging in Europe, the new world was an ideal place for more Catholics to be recruited. The Habsburg dynasty spent the Castilian and American riches in wars across Europe on behalf of Habsburg interests, defaulted on their debt several times, and left Spain bankrupt several times. These problems led to a number of revolts across his empire, notably that of Castilian rebels in the Revolt of the Comuneros, but these rebellions were put down. The wealthy preferred to invest their fortunes in public debt (juros), which were backed by these silver imports, rather than in production of manufactures and the improvement of agriculture. This helped perpetuate the medieval aristocratic prejudice that saw manual work as dishonorable long after this attitude had started to decline in other west European countries. The silver and gold whose circulation helped facilitate the economic and social revolutions in the Low Countries, France and England and other parts of Europe helped stifle them in Spain. The problems caused by inflation were discussed by scholars at the School of Salamanca and arbitristas but they had no impact on the Habsburg government. The Castilian Empire abroad was initially a disappointment. It did stimulate some trade and industry, but the trading opportunities encountered were limited. Matters began to change in the 1520s with the large-scale extraction of silver from the rich deposits of Mexico's Guanajuato region, but it was the opening of the silver mines in Mexico's Zacatecas and Potosí in Upper Peru (modern-day Bolivia) in 1546 that became legendary. During the 16th century, Spain held the equivalent of US$1.5 trillion (1990 terms) in gold and silver received from New Spain. Ultimately, however, these imports diverted investment away from other forms of industry and contributed to inflation in Spain in the last decades of the 16th century: "I learnt a proverb here", said a French traveler in 1603: "Everything is dear in Spain except silver". This situation was aggravated by the loss of much of the commercial and artisan classes with the expulsions of the Jews (1492) and Moriscos (1609). The vast imports of silver ultimately made Spain overly dependent on foreign sources of raw materials and manufactured goods. While not directly an inheritance, Charles was elected emperor of the Holy Roman Empire after the death of his grandfather Emperor Maximilian thanks to prodigious bribes paid the prince-electors. Charles became the most powerful man in Europe, his rule stretching over an empire in Europe unrivaled in extent until the Napoleonic era. It was often said during this time that it was the empire on which the sun never set. This sprawling overseas empire of the Spanish Golden Age was controlled, not from inland Valladolid, but from Seville, where the Casa de Contratación (House of Trade) regulated commerce with the Indies, as well as licenses for emigration. The supreme body for administering the Indies was the Council of the Indies, established in 1524. 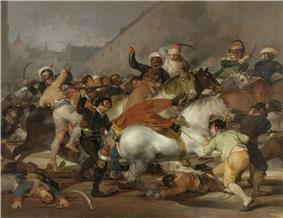 The period of the 16th to the mid 17th century is known as "the Golden Age of Spain" (in Spanish, Siglo de Oro). As a result of the marriage politics of the Catholic Monarchs (in Spanish, Reyes Católicos), their Habsburg grandson Charles inherited the Castilian empire in America, the Possessions of the Crown of Aragon in the Mediterranean (including a large portion of modern Italy), lands in Germany, the Low Countries, Franche-Comté, and Austria (this one, along with the rest of hereditary Habsburg domains was almost immediately transferred to Ferdinand, the Emperor's brother). The judgment of Seville of May 1511 recognized the viceregal title to Diego Columbus, but limited it to Hispaniola and to the islands discovered by his father, Christopher Columbus, nevertheless his power was limited by royal officers and magistrates constituting a dual regime of government. Therefore, the king Ferdinand II of Aragon as regent of his daughter the queen Joanna separated the territories of mainland, designated as Castilla de Oro, from the viceroy of Hispaniola, establishing as General Lieutenant to Pedrarias Dávila in 1513 with functions similar to those of a viceroy, remaining Balboa subordinated as governing of Panama and Coiba on the Pacific Coast, and that after his death returned to Castilla de Oro. The territory of Castilla de Oro did not include either Veragua (which was comprised approximately between the river Chagres and cape Gracias a Dios), due to this territory was subject to a lawsuit between the Crown and Diego Columbus, or the region farther north, towards the Yucatán peninsula, explored by Yáñez Pinzón and Solís in 1508–1509, due to its remoteness. 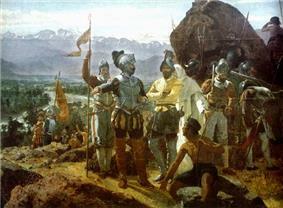 The conflicts of the viceroy Columbus with the royal officers and with the Audiencia, created in Santo Domingo in 1511, caused his return to the Peninsula in 1515. In 1508, the Board of Navigators met in Burgos concurred the need to establish settlements on the mainland, a project entrusted to Alonso de Ojeda and Diego de Nicuesa as governors, subordinated to the governor of Hispaniola, who was the newly appointed Diego Columbus, with the same legal authority that Ovando. 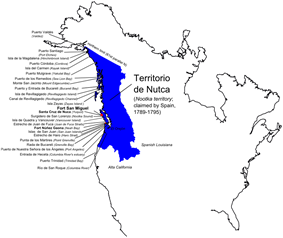 The first settlement on the mainland was Santa María la Antigua del Darién in Castilla de Oro (now Nicaragua, Costa Rica, Panama and Colombia), settled by Vasco Núñez de Balboa in 1510. 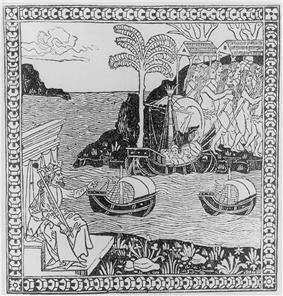 In 1513, Balboa crossed the Isthmus of Panama, and led the first European expedition to see the Pacific Ocean from the West coast of the New World. In an action with enduring historical import, Balboa claimed the Pacific Ocean and all the lands adjoining it for the Spanish Crown. Following the settlement of Hispaniola which was successful towards the end of the 1490s, the settlers began searching elsewhere to begin new settlements, since there was little apparent wealth and the numbers of indigenous were declining. Those from the less prosperous Hispaniola were eager to search for new success in a new settlement. From there Juan Ponce de León conquered Puerto Rico (1508) and Diego Velázquez took Cuba. In metropolitan Spain, the direction of the issues of the Indies was taken over by the Bishop Fonseca between 1493 and 1516, and again between 1518 and 1524, after a brief period of Jean le Sauvage. After 1504 the figure of the secretary was added, so then between 1504 and 1507 Gaspar de Gricio took charge, between 1508 and 1518 Lope de Conchillos followed him, and since 1519, Francisco de los Cobos. Catholic Monarchs reacted when Columbus encountered the mainland in 1498. They learned of his discovery in May 1499, and, taking advantage of a revolt against Columbus in Hispaniola, they appointed Francisco de Bobadilla as governor of the Indies with civil and criminal jurisdiction over the lands discovered by Columbus. He, however, was soon replaced by Nicolás de Ovando in September 1501. Henceforth, the Crown would authorize to individuals voyages to discover territories in the Indies only with previous royal license, and since 1503, the monopoly of the Crown was assured by the establishment of Casa de Contratación (House of Trade) at Seville. But the successors of Columbus litigated against the Crown until 1536 for the fulfillment of the Capitulations of Santa Fe in the pleitos colombinos. The early history of the first settlements are deeply entwined with Christopher Columbus and his extended family and the crown's attempts to limit the expansive powers granted by the crown's first contract with Columbus, the Capitulations of Santa Fe. Although Columbus staunchly asserted and believed that the lands he encountered were in Asia, the paucity of material wealth and the relative lack of complexity of indigenous society meant that the Crown of Castile initially was not concerned with the extensive powers granted Columbus. However, as the Caribbean became a draw for Spanish settlement and as Columbus and his extended Genoese family failed to be recognized as officials worthy of the titles they held, there was unrest. The Crown of Castile's Capitulations of Santa Fe granted expansive power to Christopher Columbus, including exploration, settlement, political power, and revenues, with sovereignty reserved to the Crown of Castile. The first voyage established sovereignty for the crown and the crown acted on the assumption that Columbus's grandiose assessment of what he found was true, so that Spain negotiated the Treaty of Tordesillas with Portugal to protect their territory on the Spanish side of the line. The crown fairly quickly reassessed its relationship to Columbus and moved to assert more direct crown control over the territory and extinguish his privileges. With that lesson learned, the crown was far more prudent in the specifying the terms of exploration, conquest, and settlement in new areas. 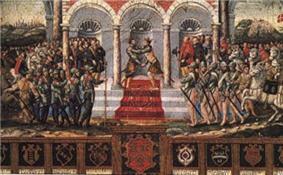 The lordship of the discovery territories conveyed by papal bulls was private as public to kings of Castile and León. The political condition of the Indias were to transform from "Lordship" of the Catholic monarchs to "Kingdoms" for the heirs of Castile. Although the Alexandrine Bulls gave full, free and omnipotent power to Catholic Monarchs, they did not rule them as a private property but as a public property through the public bodies and authorities from Castile, and when those territories were incorporated into the Crown of Castile the royal power was subject to the laws of Castile. According to the domain granted by Papal bulls and the wills of queen Isabella of Castile in 1504 and king Ferdinand of Aragon in 1516, such property become definitely a property of the Crown of Castile. This arrangement was ratified by successive monarchs, beginning with Charles I in 1519 in a decree that spelt out the juridical status of the new overseas territories. In the 1506 Treaty of Villafáfila king Ferdinand the Catholic renounced not only the government of Castile in favour of his son-in-law Philip I of Castile but also the lordship of the Indies, withholding a half of the income of the kingdoms of the Indies. Joanna of Castile and Philip immediately added to their titles the kingdoms of Indies, Islands and Mainland of the Ocean Sea. But the Treaty of Villafáfila did not hold for long because of the death of Philip; Ferdinand returned as regent of Castile and as "lord the Indies". The Catholic Monarchs had developed a strategy of marriages for their children in order to isolate their long-time enemy: France. 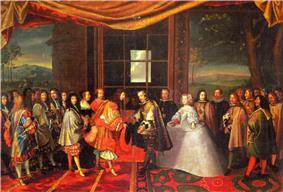 The Spanish princes married the heirs of Portugal, England and the House of Habsburg. Following the same strategy, the Catholic Monarchs decided to support the Catalan-Aragonese house of Naples against Charles VIII of France in the Italian Wars from 1494. As King of Aragon, Ferdinand had been involved in the struggle against France and Venice for control of Italy; these conflicts became the center of Ferdinand's foreign policy as king. In these battles, which established the supremacy of the Spanish Tercios in European battlefields, the forces of the kings of Spain acquired a reputation for invincibility that would last until the mid-17th century. 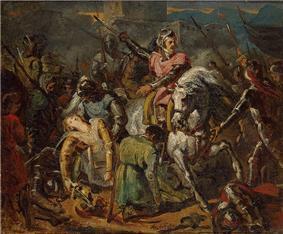 The death of French general Gaston de Foix at the Battle of Ravenna (1512). On the other hand, the treaty of Tordesillas and the treaty of Cintra (18 September 1509) established the limits of the Kingdom of Fez for Portugal, and outside of these limits the Castilian expansion was allowed, beginning with the conquest of Melilla in 1497. Since the Portuguese wanted to keep the line of demarcation of Alcaçovas running east and west along a latitude south of Cape Bojador, a compromise was worked out which was incorporated in the Treaty of Tordesillas dated on 7 June 1494, in which the globe was split into two hemispheres dividing Spanish and Portuguese claims. These actions gave Spain exclusive rights to establish colonies in all of the New World from north to south (except Brazil), as well as the easternmost parts of Asia. The treaty of Tordesillas was confirmed by Pope Julius II in the bull Ea quae pro bono pacis on 24 January 1506. Spain's expansion and colonization was driven by economic influences, a yearning to improve national prestige, and a desire to spread Catholicism into the New World.